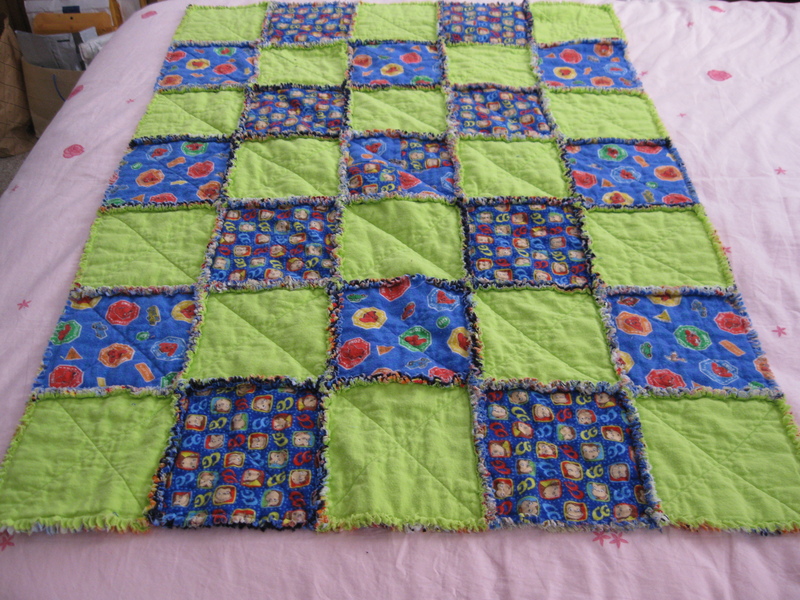 Rag quilt, done at last! I finally finished the quilt I have been working on for big brother! I’m so excited. 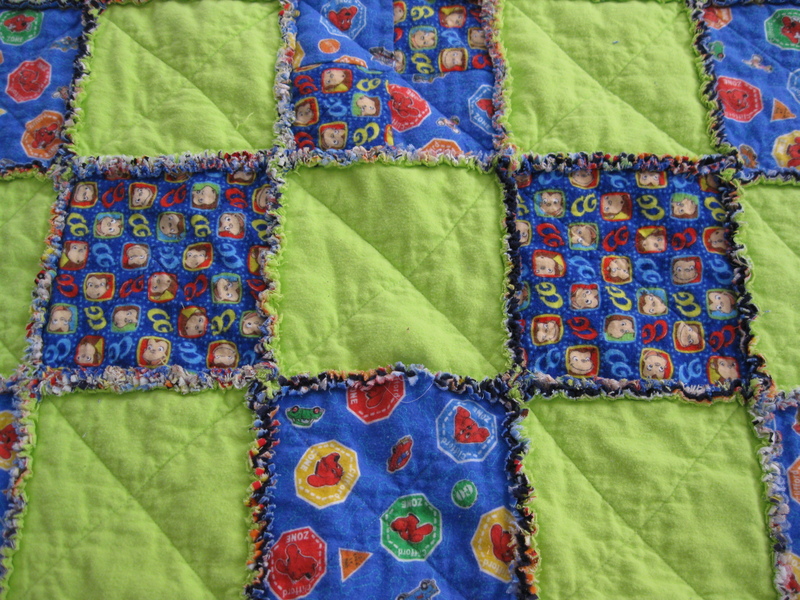 Many websites led me to believe that making a rag quilt is a simple, couple-of-hours project. Wrong! So here’s the story. Lately I have been sewing a lot of baby gifts for friends, and I love doing baby gifts, it’s a ton of fun, but lately I felt like I was neglecting my own kiddos in my sewing. 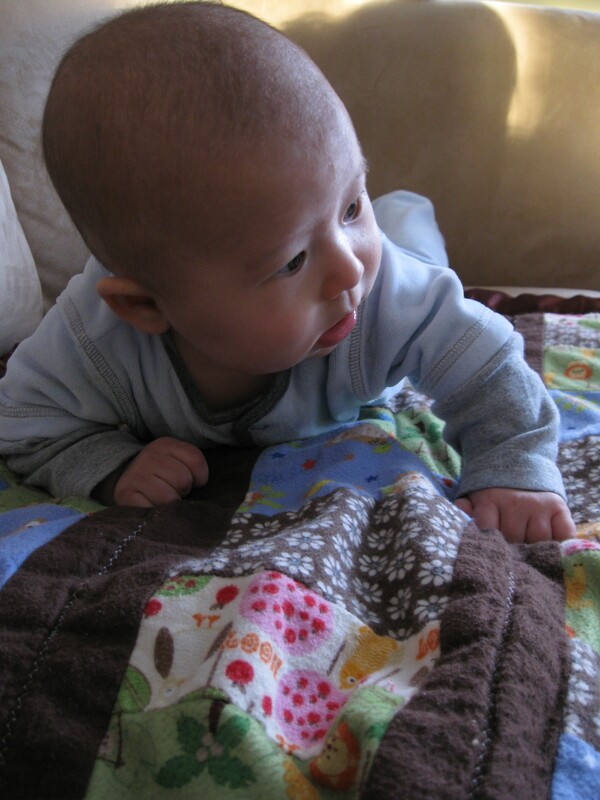 So I quickly put together a blanket for little brother out of scraps from my endless supply of Joann’s snuggle flannel. I thought that was better than a picture of the blanket alone. 🙂 Then I took big brother to Joann one day and let him pick some fabrics for a blanket of his own. He very excitedly chose Curious George, Clifford the Big Red Dog, neon green, and some construction machines. Organizing them in an aesthetically appealing way was a challenge! For the actual construction, I found a tutorial at Green Apple Orchard, and more or less followed it. I started it back when I posted the yogurt tutorial, so it’s been about a month of work! Now, to be fair, we were out of town for a while, and I might have worked on other projects too, but this was most of the sewing I’ve done. And it’s only toddler bed sized! The navy and stripes were fabrics I had on hand. There’s one big “oops”; can you see it? * This would have been so much easier if I had planned the size out and THEN gone fabric shopping. As it was, I let BB pick fabrics then bought a random amount of each. This is a really dumb way to go about making a quilt. * I pre-washed the fabrics out of habit, then read it was unnecessary. 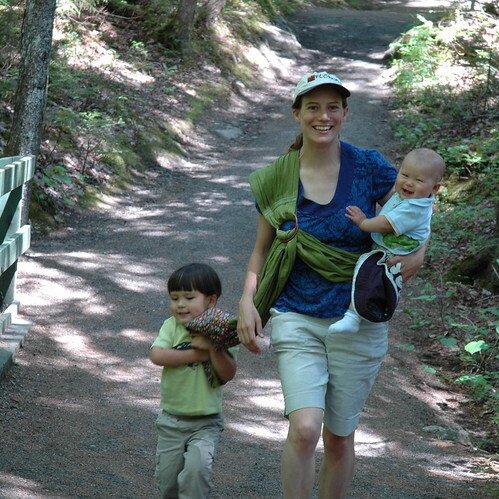 The cutting would have been a lot easier on unwashed fabrics. Oops. 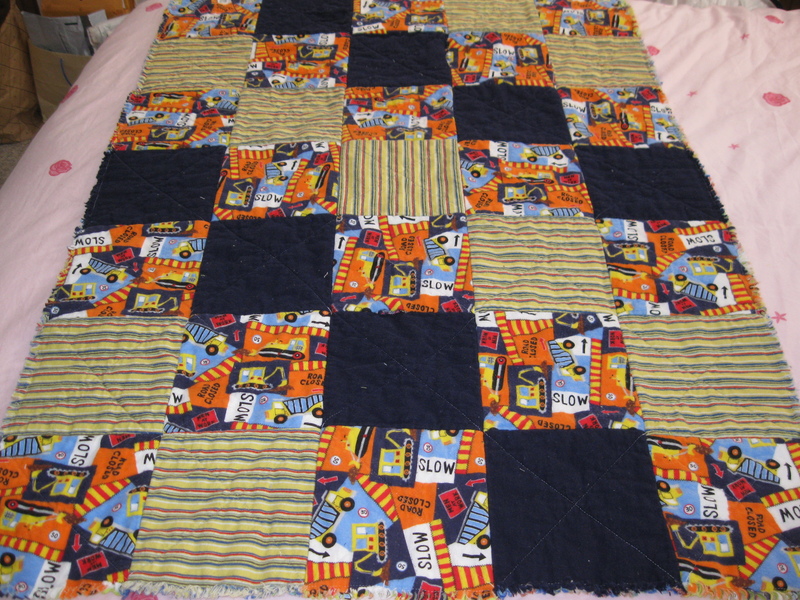 * My final big oops was in the ragging–I spent hours cutting the edges every 1/4″, and I thought I was being careful, but I must have cut seams, because when the quilt came out of the dryer, it was full of holes. I went back and sewed them up, but I should have been more careful initially. That’s it! I think next time it will be a lot easier, and there probably will be a next time, when BB moves to a bigger bed.